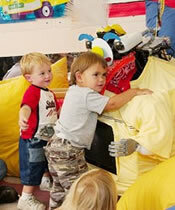 The children hug RUBI, but she doesn't hug them back - because as a developing humanoid robot she still can't. RUBI, a Robot Using Bayesian Inference, is the evolving creation of the Machine Perception Laboratory at the University of California, San Diego. Together with QRIO, a research platform for advanced robotic technologies developed by Sony Corporation, RUBI is attending the Early Childhood Education Center at UCSD as part of a long-term research study to investigate the uses of interactive computers in educational environments and to advance the field of real-time, social robotics. Led by Javier Movellan, director of the Machine Perception Lab, the study, known as the RUBI Project, is a collaborative endeavor with R&D organization Sony Intelligence Dynamics Laboratories Inc. Both RUBI and QRIO are immersed for about an hour at a time in the ordinary activities of the 10- to 24-month old children of ECEC Classroom 1. Soft, warm and pleasantly plump (with a slight tendency to boxiness), the three-foot-tall RUBI has a head, two arms and is mounted on four non-motorized wheels for ease of transportation. She has two cameras for eyes and a third, omni-directional camera, for peripheral vision, mounted on an antenna on her back. Five high-powered CPUs form her body; an additional cluster of 24, back at the lab, are used for experiments that help her learn and progress. Currently, RUBI is capable of tracking heads and detecting faces and basic expressions. RUBI teaches the children songs and, through the touch-screen on her belly, presents them with interactive games so they can learn colors, shapes and other materials targeted by the developmental profile from the California Department of Education. QRIO, whose names stands for Quest for Curiosity, is bipedal, about 23 inches tall and weighs a little over 15 pounds. With state-of-the art autonomous abilities that include dancing in response to humans, QRIO engages with the children in play and exercise activities. "Our team is working on understanding what it takes to have a natural interaction between robots and humans," said Movellan, a developmental psychologist by training. "We have a long way to go yet, but it is our belief that to be useful to people, in education settings or elsewhere, robots will have to get better at what humans do brilliantly without thinking - recognizing a voice, for example, or smiling back at just the right time." playing chess at the level of a grandmaster," Movellan added, referring to Deep Blue's historic 1997 win over Gary Kasparov, "but that's easy for them. What's difficult is what we underestimate and take for granted, like emotional expression or correctly picking out an object regardless of light conditions. Genuine interaction will have to go far beyond computing capacity or a sterile cognition. It will have to be about forming relationships." Now the researchers are attending almost daily, with QRIO playing the role of peer and RUBI, the role of assistant teacher. The research team is recording sessions with video cameras and then coding the quality of the interactions. Participating ECEC teachers, parents and children are helping to guide the study. Early on, it was thought, for example, that RUBI should be able to identify the children by name, but they are proving indifferent to the feature so that development is being dropped. unfailingly honest critics. When they get bored, they communicate unequivocally with their actions: Stop. Turn away. Move on to whatever person or thing is more interesting. Fumihide Tanaka, a Sony Intelligence Dynamics Laboratories Inc. researcher working on the RUBI Project, has observed that interaction with QRIO is diminishing over time. He also recently discovered that the children - who are typically bigger fans of repetition than either older kids or adults - lost interest in dancing with QRIO after about a dozen reprises of the same song. "The next step," Tanaka said, "is to improve the interactivity of the dance and figure out how to re-attract the attention of the children." Next targets for RUBI - who was designed to be built up by one or two components at a time, in accordance with results of the field observations - include being able to point, hold the children's hands and hug them back. While the researchers are puzzling over future technical challenges, Lydia Morrison, the lead teacher of Classroom 1, says that RUBI and QRIO have become valuable members of the class. "It's an enriching experience for both the children and the teachers," Morrison said. "We need tools, we need teaching aids in the classroom. RUBI and QRIO could become real helpers one day. And for now, they are doing something just as important - they are helping us imagine new ways of teaching." The experience is also fun. Tickling RUBI's sensitive TV belly so she giggles produces laughs from the people too. And, each time QRIO lies down on the floor at the end of a session for system shutdown, it draws a small crowd and a queue forms to cover him with a blanket and wish him "night-night." The RUBI Project is supported by a UC Discovery Grant and Sony Corp. Other researchers on the project include Kazuki Aisaka of Sony Corp. and Bret Fortenberry of UCSD. Early findings will be presented at the IEEE International Conference on Development and Learning, in Osaka, Japan, July 19-21. Contingent on renewed funding, the RUBI Project will begin controlled experiments next year to see if interactive, social robots are better instructional tools for the teachers than simple computer kiosks.